1. RJ, the kids, and I enjoyed a day together at the ball park yesterday for softball/baseball tryouts. It was a lot of fun and a beautiful day to be outside! 2. I met with all three of my kids' teachers this week to talk about their progress and school achievements. It's always enlightening to hear about your children from someone else who knows them well. They have great, loving, and caring teachers. 3. E and I got up early this morning and made pancakes together. It was fun to work in the kitchen and have time to talk and listen to him this morning. 4. N and I went for a walk together this week. Again, having time with just one child at a time is precious! She talked the entire walk. 5. B and I had time alone for a quick errand run this week. It's nice to find out what she's thinking and how she perceives things are going. 6. I completed all 20 of my parent/teacher conferences on a positive note. I had 2 particular concerns that were discussed productively. I feel like we're headed in the right direction with both of these kids, and the parents and administration are supportive of my efforts. It's good to know we're all on the same page and have the children's best interest in mind. 7. The gorgeous, warm weather has made being outside wonderful! I have spring fever already! 8. Bonus: I planned a trip this week for my family and my parents. We're going over Spring Break and I can't wait! I'm anxious to go and spend some good time together! 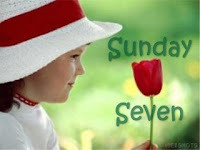 Glad you joined Sunday Seven! I've missed your posting recently, but sure understand how it gets so busy with work and family. I love your list. Even though we had a great P/T conference, it never occured to me to be thankful for it. One of those things I just realized I take for granted. Thanks for sharing! Enjoy those walks with the kids -- they grow sO fast - and once they acquire wheels, walks don't happen to often anymore! I'm glad you take time for that! We just got back from a long walk outside -- I love it when the weather is mild and just right for walking. Oh, My! What Children Learn at School!